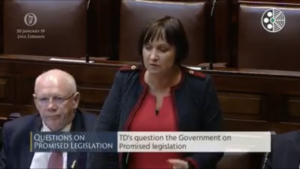 O’Loughlin said, “I raised my concerns for the increase in VAT from 0 to 23% on food supplements, including vitamins and minerals with the Minister for Finance. To implement such increases will penalize people who make positive choices in looking after their health. I am concerned that this may compromise people spending money on their supplements as many are already struggling to keep up with bills. 100,000s of people across the country and thousands in Kildare are dependent on taking vitamins daily as part of their daily regime. O’Loughlin concluded, “There has been a zero-VAT rating on these products since 1972 and now the VAT is going up drastically. I urged the Minister to make an effort to repeal this increase as this will have negative impacts on the supplement industry and the people taking those supplements for health reasons.